Our group walks through a crumbling palace as waves crash on the beach below. It’s a beautiful, blue-sky day, a scene reminiscent of our California home. Except that beaches in the Monterey Bay don’t have elaborate Roman ruins. We’re about seventy miles northwest of Jerusalem at the formerly luxurious seaside home of Pontius Pilate: Caesarea Maritime. Forty years before the crucifixion of Christ, Herod the Great built a gleaming new city and state-of-the-art harbor here that served as the headquarters of the Roman presence in Israel. Underwater archaeologists are still figuring out how Herod’s builders used hydraulic cement to create two massive breakwaters in order to shelter the harbor. In Jesus’ day, this city featured spectacular palaces, a marble temple to Caesar, a racetrack with seating for twenty thousand spectators, an elaborate aqueduct system which piped in fresh water from the mountains many miles away, and a beautiful theater which faced the Mediterranean Sea. It’s at this theater that archaeologists discovered the first physical evidence of the Roman governor Pontius Pilate. His name was inscribed on a stone in the theater, on a dedication to his boss, the Caesar Tiberius. And it was from this city that Pilate set out for Jerusalem’s Passover Feast around 30 AD. He was surely hoping that his mere presence there would dissuade any troublemakers from starting a revolt. Pilate went to Jerusalem every year at the same time, just to establish a reminder of Roman authority during the pilgrimage. And every year he went back to his coastal headquarters without many incidents to report. Except for one year, the year he wrote himself into the most famous story in history by sentencing Jesus to death. So why would a guy this cruel have hesitated for one second to crucify Christ? Well, Pilate was apparently on thin ice with his Roman supervisors several times during his administration. According to Josephus, Pilate was officially rebuked by Rome for antagonizing the Jews in Jerusalem on at least one, and possibly two occasions. This may help explain why Pilate seems so indecisive about what to do regarding Jesus. He was really in a conundrum. On the one hand, his role as Roman prefect is to prevent insurrection. He’ll get into trouble with Caesar if he allows the political situation to get out of control. If Jesus is claiming to be a king, then he must clearly be treated as a traitor to the government, punishable by death. On the other hand, Pilate’s under pressure from Rome to stop approving executions without adequate trial. So should he use capital punishment against a possible rebel, or should he demonstrate to Rome that he has stopped the trend of hasty executions? But then what if a hasty execution is being demanded by the very people Rome has told him not to offend? Throughout this account, he seems to be asking himself which course of action is less likely to get him into career trouble, not what is the right thing to do. Finally he approves the crucifixion — yet attempts to avoid legal responsibility by “washing his hands” of the situation (Matthew 27:24). Hand washing was a Jewish custom originating in Deuteronomy 21 and amplified in the Mishnah. Pilate is using the Pharisees’ own symbolism in a desperate, falsely pious attempt to justify what he felt uncomfortable doing. He was performing a religious ritual in advance of a sin to try and escape the consequences, like a man going to confession before meeting his mistress. This is not a man sincerely seeking truth. This is a politician just trying to cover his you-know-what. When I look over the beautiful vista of the Mediterranean from Pilate’s home base in Caesarea Maritime, I understand some of his motivation. It’s really nice here. Pilate wants to leave Jerusalem without any career-threatening incident and get back home. Back to his palatial beachfront estate. Back to his Roman culture and entertainment and luxuries. He sees the Jews, including Jesus, as bothersome irritants, threats to his comfortable status quo. To me, Pilate is emblematic of the way many people treat the claims of Christ. They don’t really listen to what Jesus is saying as much as they calculate the social cost of their response. Misunderstanding. Pilate seems eager to interpret Jesus’ kingdom language as something merely political, earthly — even when Christ corrects him. Similarly, people today seem to want to reinterpret the message of Jesus as primarily social or political to escape his personal, spiritual claims on their lives. Of course, his spiritual message does have social implications. But the kingdom of God starts in the heart. Social position. Pilate has heavy equity in his political world, and so he’s stuck in that paradigm. He can’t seem to take seriously Christ’s claims that there is an invisible kingdom not of this world that is far more important than the visible empire. Or maybe he just finds such claims a little unsettling. Because if Jesus is right, Pilate’s whole value system must change. There are so many alternative belief systems in the modern world (as there were in the first century, incidentally!) that it’s easier to shrug and say, “What is truth — It’s all relative!” than commit to a decision. But of course, in not deciding, you’re still making a choice. You can try to wash your hands, try to say you want nothing to do with him, but in the end we’re all judged by what we do with Jesus. Was Jesus who he claimed to be? In a way, Jesus is still on trial in every heart today. What’s your verdict? What have you decided about Jesus? How has that decision impacted you? 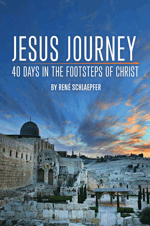 Buy Jesus Journey at Amazon.com or in person at Twin Lakes Church.